Bay Club at Frisco are lake front condos in Frisco Colorado Real Estate. Built in 1997 there are 32 units comprised of 16 – two bedrooms and 16 – three bedroom condos. Each Bay Club at Frisco condo comes with a detached 1-car garage. 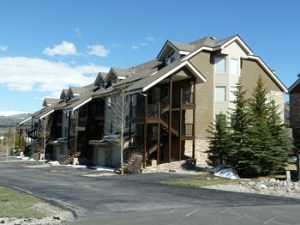 The complex is situated so that every condo has a view of Lake Dillon from their spacious decks. There is an on-site common hot tub at Bay Club at Frisco with spectacular mountain and lake views. Directly in front of this Frisco condo complex is the Summit County Recreation Path where you can run, bike, walk to nearby Dillon, Keystone, Breckenridge, Copper Mountain and more. A short walk along the Summit County Recreation Path will take you to the Frisco Marina where you can rent boats, kayaks, canoes or simply enjoy a drink or bite to eat at the Island Grill. These Frisco condos are also centrally located for easy access to skiing at six world renowned ski resorts within 45 minutes. If you are looking for a Frisco CO condo with exceptional mountain and lake views take a look at Bay Club at Frisco, these are exception condos for sale in Frisco CO Real Estate.